Vallibel Finance, opened a branch in Matara recently, Managing Director of Vallibel Finance PLC Jayantha Rangamuwa said: “We are glad to be in Matara, which is home to such a proud community of business folk, and see it as the perfect chance to broaden our horizons in offering customers the best in streamlined financial solutions”. “To join a community as renowned for its business acumen as Matara is truly an honour”, said Chairman Dhammika Perera. “Vallibel Finance in a short-time, has become a front-runner in the finance sector”, he said. 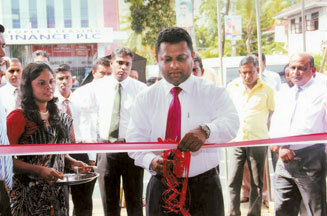 Vallibel opened its latest branch at Anagarika Dharmapala Mawatha, Matara.